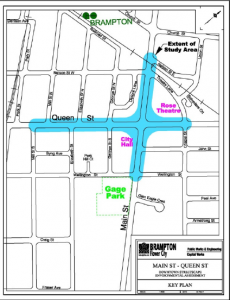 As part of the downtown revitalization efforts, the City of Brampton has initiated a Class Environmental Assessment (EA) for streetscaping in the downtown to create an aesthetically beautiful environment. The main objectives are to study alternatives that will capitalize on the walkability, pedestrian capacity, active transportation in the downtown, and to animate these streets to become a place making destination. A number of alternative cross sections for both Queen Street and Main Street have been developed and are being examined as part of this study. Replacement/Relining: Downtown Brampton Capital Project Phase 1. It is in accordance with the planning and design process as outlined in the Municipal Class Environmental Assessment (Class EA) document (October 2000, as amended in 2007, 2011 and 2015), approved under the Ontario Environmental Assessment Act. This study was originally classified as “Schedule “B,” however, due to the anticipated environmental impacts, the City has decided to elevate the study to a “Schedule C” classification. Anyone with an interest in this study is invited to attend and participate. If you cannot attend and would like to provide comments, please forward all comments by March 3, 2017 to project team members listed below. Details of future PIC(s) will be advertised as the study progresses. At the conclusion of the study, an Environmental Study Report will be prepared and made available for public review and comment for a 30-day period. will become part of the public record. This notice first issued on February 9, 2017.